I’m nowhere near a fighting game expert. I never count frames of animation or worry about hit box overlap. However, I have been playing fighting games since the original Street Fighter II arcade cabinets came out. I played a lot of Street Fighter and the clones that followed. The clones were trying to piggyback on the fighting game success that Street Fighter started. At first I didn’t understand what the clones were lacking and why they failed. Eventually, I realized the great design of Street Fighter II. It had near perfect balance and impressive variety. An unbalanced fighting game isn’t fun because everyone is playing the same overpowered character. Balancing a game is hard. Too many clones balanced by making all the fighters feel the same. So all the great fighting games had those two things, balance and variety. There’s one more thing they have. It’s tight controls. There’s no point in playing the game if the buttons don’t do what you need them to do when you need them to do it. You can’t master a game if precision gives you the same result as button mashing. I suppose you could argue that since the days of Kung Fu and Double Dragon, fighting games have been split between brawlers and technique fighters. For me, the split goes back to Street Fighter II and Powerstone. I’m more in the Street Fighter camp even to the point I prefer the straight one on one fighters to even the Vs. series. That’s mainly because winning felt more like mastery than luck in those games. Now, I have less time to spend on mastery. I’ve been able to appreciate the ease of play of games like Marvel vs. Capcom 3. I’ve also learned to appreciate the Super Smash Brothers series on Nintendo. Yes, there are times when the match devolves into button mashing and luck, but skill and timing will give you an edge over time. Smash Brothers is fun and chaotic. It really trades on the love of Nintendo’s broad stable of characters. As we saw with cart racing, few have enough recognizable characters to match. 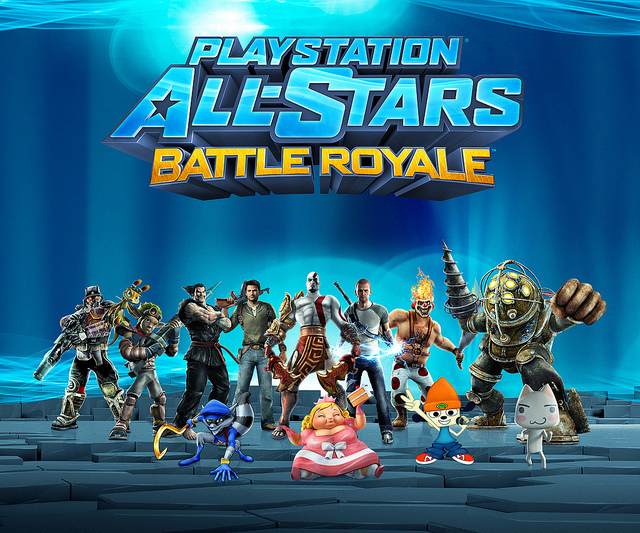 Well, now Sony has built up quite a library and they’ve entered the fighting brawler realm with Playstation All Stars Battle Royale. 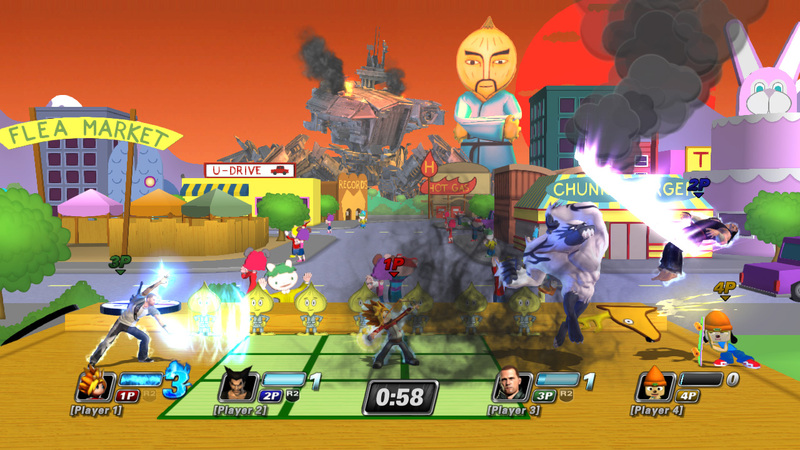 It’s a brawler supporting up to four players. Though there are different winning conditions, you only really score by eliminating other characters. You can’t eliminate them with normal attacks. Normal attacks build up your power bar. You have to catch them in your super attack to score a kill. Super attacks build to three levels. The first level is a short range attack. The second level is usually an area attack. Level three has the potential to wipe out everyone else on the battlefield. It’s up to you to decide how you want to score. Powerstone and Smash Brothers set the standard for these games. They generally used parallel controls using power, speed, animation, defense, health, hit boxes and animation to differentiate the characters. The developers at Superbot went a step further. Each character has a different and deep command set. So while everyone may have a launcher, heavy and ranged attack, they won’t necessarily be the same commands to do them. Combos feel and link together differently. This can mean a deeper and more rewarding game, but the price is a game that’s harder to learn. It’s tough call, but I think it’s worth it since the net result is that each character plays differently and appropriately for their game series. Is it balanced? That’s a tough one. Each character can win and even dominate in the hands of a skilled competitor. However, it’s hard to be great with a bunch of characters. Even within a class ( brawlers, graplers, ranged, etc.) characters feel and fight differently. What that means is that you’ll probably have one or two favorites that fit your preferred play style. It’s probably a better use of your time to master them that get a passing familiarity with more characters. Overall, the core gameplay is fun. You have to balance attack and evasion. Once any character has reached level one, it’s risky to go near them. Letting them get higher levels is risky as well. Keeping track of multiple characters across different levels of a changing battlefield isn’t easy. The levels are worth mentioning. The whole conceit of the game is that worlds are colliding. The levels reflect this. You might start in one hero’s world, but soon another hero’s enemies will invade that world. The entire layout of the level will change. Many of the invading enemies will have area attacks you have to avoid. The best part is that levels reflect the chaos happening in the battle. It’s rare that any of these invaders or level changes will unbalance a competition. They do have to be taken into consideration when plotting your moment to moment strategy. It’s got all the standard fighting game modes, story, online, versus, and training. I could go into all the pluses and minuses there, but really, is it fun and rewarding to play? It is. Are the characters varied, interesting and recognizable? Yes, they are. It’s also a cross buy game for PS3 and Vita. If you have any interest at all, it’s worth checking out. There’s more here than you’d expect at first glance. Recommended.